Enolates and related nucleophiles deserve a closer look because they are and because they have their own issues of regiochemistry. Enols typically are not seen because of a rapid equilibrium with that related carbonyl compound. As soon as an enol forms, if there is any way for it to transfer a proton to get to the carbonyl, it will do so. This kind of equilibrium is called "tautomerism," involving the transfer of one proton from one place to another within the molecule. The enol and its related carbonyl are referred to as "tautomers." "Tautomers" describes the relationship between these two molecules. Let's think about what is different about those two sides of the carbonyl. One side is more substituted. It has more stuff on it. It's more crowded. We will focus on the formation of enolate ions. 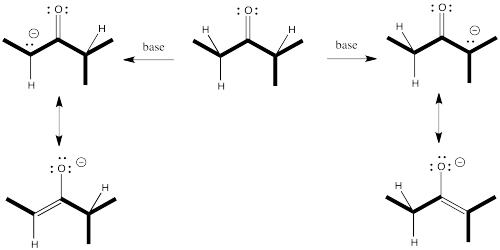 To get the proton off and turn a carbonyl compound into an enolate requires a base. Some control over which proton is removed might come from the choice of base. Maybe to get the proton off the more crowded position, you need a smaller base. But there's something else about enolates that is apparent only when you look at the ions in one resonance form. Enolate ions can be thought of as alkenes, of course. Depending on which proton we remove, we get two different alkenes. There may be factors that make one of these two alkenes more stable. If so, there may be ways to form that one instead of the other. In general, more-substituted alkenes are more stable than less-substituted ones. The more substituted alkene is formed via loss of the proton at the more crowded position. Forming a product based on its relative stability means relying on thermodynamics. One way to do that is to allow the deprotonation happen reversibly. Given multiple chances, the more stable enolate will form eventually. On the other hand, if you intend to take the proton off the least substituted position, you don't want any reversibility. Given the chance, the wrong enolate will eventually form. This is a case in which we need kinetic control to get one product: we want the least-substituted enolate, and we depend on it forming more quickly than the ther enolate. After all, if the other enolate forms , it is more stable; it isn't likely to come back. For the other product, we need themodynamic control. We depend on the eventual product stability of the more substituted enolate to pull the reaction through.